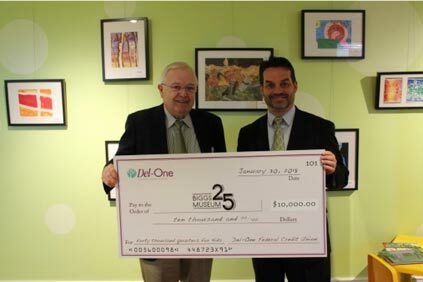 Pictured above: Del-One CEO, Dion Williams (right), presents Biggs Museum Executive Director, Charles Guerin (left), with a $10,000 check to kick-off the “Quarters for Kids” program. February 20, 2018 (Dover, Delaware) – Today, the Biggs Museum of American Art and Del-One Federal Credit Union announced a new partnership entitled “Quarters for Kids” to help celebrate the Biggs Museum’s 25th Anniversary year (2018). To kick-off the program, Del-One has invested $10,000 to the Biggs Museum to fund special programs and field trips at the museum for underserved children and families. Funding will enable the museum to host more field trips and families than ever before in our history. Specifically, it helps to fund free admission for all children as well as museum programs like Biggs Kids, in which children participate in a free, hands-on craft the first Saturday of every month in Child HELP Foundation Studio. In launching the campaign, the public is invited to join. “Quarters for Kids” kiosks will be installed in the lobby of the Biggs Museum as well as the Downtown Dover and West Dover locations of Del-One Federal Credit Union. At these interactive kiosks, children of all ages will be able to insert quarters to help support Biggs Museum programs – with the over arching of goal giving children a better understanding of financial literacy and the importance of philanthropy. The kiosks will be open to the public in early March. National studies prove that museum visits have a more pronounced impact on children from disadvantaged backgrounds because they are often not afforded such an experience due to limited resources. 40,000 quarters, or $10,000 can certainly change a lot of lives. Thanks to a Biggs Museum – Del-One partnership for the museum’s 25th silver anniversary, the Biggs is now on a trajectory to change a lot of lives this year with its “Quarters for Kids” campaign. “We are thrilled with the Del-One partnership that jump-starts such a worthwhile cause. The Biggs is proud to host hundreds of children each year from families in all strata of economic status. Given the proven leveraging impact on disadvantaged children, we decided to focus on them as a major component of our anniversary campaign. Del-One’s leadership is most appreciated.” offers Charlie Guerin. For additional information please contact Stephanie Adams at (302) 674-2111 ext. 105 or sadams@Biggsmuseum.org. The Biggs offers changing exhibitions throughout the year relating to historical and contemporary art topics. Intimate galleries offer guests an unexpected and personal experience with the collection. The museum supports the public education of art through educational programming for adults and children and special events designed to bring art to everyone. Whether it’s the first visit to the Biggs Museum or the hundredth, there is always something new to delight, surprise, enlighten, excite, and inspire.